A "Herniated Disc", anywhere in the Spine (also called bulge, dislocated, displaced, misplaced, ruptured, slipped, etc.) is usually a painful condition for which patients request assistance. It is essential to recognize that most patients can and do recover very satisfactorily from this experience without resorting to surgical intervention. The term commonly used for the non-surgical management of this problem is "CONSERVATIVE TREATMENT." Please consult our comprehensive monograph, Lumbar Disc Herniation & Degenerative Conditions, Part 1, for a thorough discussion of this entire subject. "Conservative treatment" is an "active" form of treatment, which requires consummate self-discipline and patience (on the part of the suffering individual) since the tissues involved in this "disease" process heal very, very slowly. Although most patients recover quite well without surgery, it is a common problem that frequently recurs multiple times in those affected by it. One of the most frequent causes of the "Herniated Disc" is a lifting or bending injury. 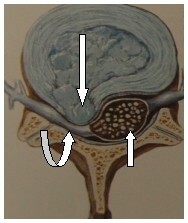 Too much pressure is exerted on the central portion (Nucleus Pulposus) of the Disc (See Figure 1). This results in pressure against the confining capsule (the "Annulus Fibrosus") and ligament (the "Posterior Longitudinal Ligament") that become stretched and injured. This dislocated portion of the Disc pushes into the bony Spinal Canal and presses the Nerve Roots against the bone of the Spinal Canal. The pressure can be sufficient to injure the Nerve Root and/or the small blood vessels of the Nerve Root resulting in a characteristic response by the Nerve Root to injury, a condition of "Nerve Root swelling". Unfortunately it swells against a hard, unyielding bone surface  the Spinal Canal. This process produces further pressure on the Nerve Root and its blood supply, which results in more injury to the Nerve Root and progressively more swelling. Hopefully, once you have a better understanding of the underlying disease process and the pathological anatomy, you will recognize the course of therapy that is best suited for you. Each Disc has several components. The center region (Nucleus Pulposus) is more viscous. A multilayered and very dense capsule confines it. "Bulging", "Displaced", "Herniation", "Misplaced", "Ruptured" and "Slipped" are all terms that are essentially synonymous. All indicate that the center portion has pushed its way through some of the layers of the "Annulus Fibrous" resulting in a portion pushing backwards into the Spinal Canal. Often times this presses upon the Nerve Roots as they exit the Spinal Canal resulting in an injury to the Nerve(s). Swelling ("edema") is a characteristic response to this injury by the Nerves and Spinal Cord. Unfortunately this results in increased pressure upon these Nervous System structures since they are confined within the bony walls of the Spinal Column. This will decrease the blood supply to the Nerve and/or Spinal Cord resulting in further injury and more swelling. THIS IS A VICIOUS CYCLE THAT CAN OFTEN BE EFFECTIVELY MANAGED WITH ORAL STEROID MEDICATION. While there is a robust industry in EPIDURAL STEROID INJECTIONS by many practitioners, WE STRONGLY RECOMMEND AGAINST THIS PRACTICE SINCE ORAL MEDICATION IS USUALLY AS EFFECTIVE AND FAR LESS COSTLY. Most patients are fortunate to experience rapid resolution of the pain since the elastic properties of the Annulus will pull the "Disc rupture" back in place. The Disc is held in its position between two adjacent Vertebrae by tenacious ligaments which themselves are attached to the bony Vertebrae. 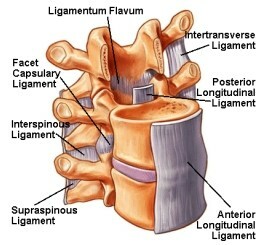 The ligaments virtually encircle the Disc. They are particularly dense in two areas running vertically in front (Anterior) and in back (Posterior) of the Disc area, the ANTERIOR and POSTERIOR LONGITUDINAL LIGAMENTS. They play an important role in the pathological process of "Herniated Discs", as well as in the long-term recovery from either non-surgical or surgical treatments. Despite apparently successful treatment (surgical or non-surgical) there is an element of risk for a recurrence of the condition with the ligament (most particularly the Posterior Longitudinal Ligament) playing a vital role in this process. Among the more serious consequences of a Herniated Disc is damage to the neural elements (Spinal Cord and/or Nerve Roots). In these cases, the patient will not only experience varying degrees of pain, they will also notice tingling or numbness in the extremity and possibly weakness. They will notice that certain body positions and activities make the symptoms worse while some positions seem to afford a margin of relief. Very serious neurological injury can occur such as paralysis of bowel and bladder function and/or extremities. These latter instances constitute a major neurological emergency requiring immediate attention by a qualified surgeon. Figure 3: "Extruded" Lumbar Disc. Note how the Nucleus Pulposus has torn the encircling Annulus Fibrosus resulting in part of the Disc being dislocated into the Spinal Canal (Down-directed Arrow). This has pushed the nerve (Up-curved Arrow) backwards against the "roof" of the Spinal Canal while pushing the other nerve roots (Up-directed Vertical Arrow) over to the opposite side. Here, only a part of the disc has ruptured. What do you believe will happen to all the nerve roots if more disc material herniates out? Figure 4 A (Left): MRI Scan (Lateral View). The disc has migrated inferiorly (down) the Spinal Canal and lies behind the vertebral body of L5 (Arrow). The diagnosis of these problems is often left to Primary Care Physicians. It is encouraging to know that the vast majority of patients will improve without any active intervention. Your personal physician is best able to guide you through this process. There are some common and simple physical examination methods which will give clues to the cause of the problem. Often times a Neuroimaging study is used to more accurately identify the underlying cause(s). MRI Scan is the most accurate and efficient Neuroimaging study for most patients with these problems (See Figure 4). Lumbar Myelogram and Post-myelographic CT Scan may become necessary for some patients with more complicated Spine conditions such as high-grade multi-level Spinal Stenosis (See Figures 3, 4 & 6 in our Spinal Stenosis section) and/or Spondylolisthesis. In order to recover from this problem, two events must occur. The pressure must come off the Nerve Root and the swelling must reverse. These events can be promoted in a number of ways. The easiest method of management is the most effective in accommodating both of these requirements. It is straightforward, quite simple in concept and readily available to all. We are referring to BED REST which accomplishes two things. By lying down, the pressure on the Disc, that ordinarily occurs when humans are upright, is diminished. Therefore, continuing pressure on damaged internal Disc structure is limited. The elastic tensile strength inherent to the Annulus Fibrosus and the Posterior Longitudinal Ligament will then "pull" the Herniated Disc material (the Nucleus Pulposus) back into position. Once the pressure on the Nerve Root(s) is reversed, the Nerve Root swelling subsides. The intention of this treatment is to allow the Herniated Disc material to resume its former position. This will usually happen within hours to several days after the onset of treatment. The pain that accompanies this problem also will improve significantly, particularly the portion that is deep in the buttock and/or leg and foot. Spinal "manipulation" done by Chiropractors, Osteopathic physician or Orthopedic surgeons clearly can benefit some patients with a Herniated Lumbar Disc. Part of the benefit is derived from the accompanying application of Heat Therapy, Massage and Ultrasound treatment that often accompanies these sessions. "Physical Therapists" frequently provide similar services although "manipulation" is generally left to practitioners licensed for this treatment. Other Physical Therapy exercises (including the "William's Back Regimen") are of value for many patients. Spinal Manipulation, in any form, is ABSOLUTLY CONTRAINDICATED IN THE PRESENCE OF SIGNIFICANT NEUROLOGICAL DEFICITS since this usually indicates the presence of a large intraspinal Herniated Disc. The application of some form of Traction to the Lumbar Spine can also offer relief for many affected individuals. The physiologic principles underlying this are similar to the explanation offered above regarding "Bed Rest", that is the "inherent tensile strength" and "elastic properties" of the Annulus Fibrosus and the Posterior Longitudinal Ligament may be sufficient to reduce the Herniated Nucleus Pulposus back into position. "Traction Therapy" takes advantage of these properties by "decompressing" the affected Disc using a physical force applied to the Pelvis and/or Lower Extremities. In this way the pressure in the INTERIOR portion of the Disc is reduced. It is at this point that the Herniated portion of the Disc may be able to reposition itself. There exists a multitude of "Traction" devices and systems, several of which are heavily advertised by Chiropractors, Osteopaths, Orthopedic and Neurological Surgeons who incorporate them in their private practices. Some devices are available for "home use" such as the "tilt table" variety that uses the body's own weight as the "traction force". Contraindications to "Traction Therapy" include the presence of a "migrated" extruded Disc, high grade Spinal Stenosis with a large Herniated Disc and the presence of significant Neurological Deficit(s). An increasingly popular treatment method is the injection of steroids (with or without an anesthetic agent) into the Spinal Canal, a procedure called Epidural Steroid Injection or ESI. The rationale behind this therapy lies in the recognition that STEROIDS CAN REDUCE THE SWELLING OF THE NERVE ROOT WHICH OCCURS DUE TO PRESSURE FROM A HERNIATED DISC AND/OR A TIGHTLY NARROWED SPINAL CANAL OR NEURAL FORAMEN. STEROIDS CANNOT IMPROVE UPON A HERNIATED DISC. IN ADDITION, STEROIDS (NOR ANY OTHER MEDICATION) CAN POSITIVELY AFFECT THE "DEGENERATIVE ARTHRITIC OVERGROWTH" THAT PRODUCES NARROWING (STENOSIS) OF THE SPINAL CANAL OR NEURAL FORAMEN. IN FACT, STEROIDS ACTUALLY INTERFERE WITH THE NORMAL HEALING PROCESS OF THE DAMAGED TISSUE INCLUDING THE POSTERIOR LONGITUDINAL LIGAMENT. Anyone contemplating allowing this procedure should be aware of the additional risks associated with this procedure. "ESI" requires the introduction of a needle or catheter inside an already compromised Spinal Canal. This could result in DAMAGE to the Nerve Roots and/or Dura Mater (the latter may well result in a leak of Cerebrospinal Fluid.) Also, there are risks to INFECTION as well as ADVERSE REACTIONS to the injected medications and HEMORRHAGE from the many small blood vessels in the Spinal Canal. Another negative consequence to the Intraspinal injection of steroids is the ACCUMULATION OF A "RESIDUE" OF THE "CARRIER" AGENT USED TO KEEP THE STEROID MEDICATION in a liquid medium as it is injected. We have had very many occasions to operate on patients who have had Intraspinal steroid injections and find additional scar material as a direct result of this "left over" material which, in our opinion, is deleterious to the body. IN OUR EXPERIENCE, IT IS MORE APPROPRIATE TO ATTEMPT A SHORT COURSE OF ORAL STEROIDS RATHER THAN RISK INJECTIONS INTO THE SPINAL CANAL. There are many alternative procedures, all of which involve some form of "injection" or "needle-like" instrumentation. We encourage you to consult our monograph on Lumbar Disc Herniation & Degenerative Conditions, Part 2-Surgical Treatments, for a thorough review. It is our hope that patients suffering this problem will take time to understand the parameters that influence their recovery. We have prepared a comprehensive monograph that reviews this subject in considerable detail. We encourage you to consult our document entitled Lumbar Disc Herniation & Degenerative Conditions, Part 1, for a thorough discussion of the MEDICAL "CONSERVATIVE" TREATMENT. Once there is evidence of Neurological injury, it is wisest to consult with an expert in Spine Problems. Choosing this Neurosurgical Consultant warrants your serious attention. It is important for you to know what to expect of that Consultant prior to your visit. SURGERY is INDICATED in the presence of NEUROLOGICAL DEFICIT that CORRELATES WITH THE HERNIATED DISC that has been DEMONSTRATED ON NEUROIMAGING STUDIES. For most patients who have suffered significant Neurological injury consequent to a "Herniated Disc", it is the result of the Disc material having "extruded" through the Annulus Fibrosus resulting in a part of the Disc occupying a significant portion of the interior of the bony Spinal Canal thus exerting intolerable pressure upon the Spinal Cord and/or Nerve Roots (See Figures 3 & 4). Pain, in the absence of Neurological deficit and "mechanical signs" (on neurological examination) of Nerve Root entrapment, is not necessarily an indication to operate UNLESS there is a large "mass" of Herniated Disc material within the Spinal Canal. An "extruded Disc" that has "migrated" within the Spinal Canal almost invariably constitutes a surgical problem. Modern surgical options have, fortunately, improved the outlook for these patients with reliable and efficient microsurgical and Minimally Invasive procedures. In both procedures, a "bone window" is fashioned in the Lamina (the "roof" of the Spinal Canal) through which the surgeon gains access into the Spinal Canal. The Nerve Roots, which are protected by a leather-like covering (the Dura Mater), are identified in the interior of the Spinal Canal after the Ligamentum Flavum ("Yellow Ligament") is opened and partially removed. Frequently, the Nerve Root is tightly stretched over the "extruded" Disc fragment(s) and/or bone spur. It must be protected, gently mobilized and perhaps moved a short distance in order to allow access to the "mass" of extruded Disc inside the Spinal Canal. The extruded Disc is then removed. In the event that the hole in the Posterior Longitudinal Ligament and Disc capsule is not large enough to permit easy placement of instruments (used to retrieve the remaining Disc material from the Disc space), the hole must be enlarged. The retractor is removed and the tissues are allowed to regain their former positions after the remaining Disc has been removed (to the extent possible). Our STRONG PREFERENCE IS TO REMOVE AS MUCH DISC MATERIAL FROM THE INTERIOR OF THE DISC SPACE AS POSSIBLE IN ORDER TO REDUCE THE RISK OF A "RECURRENT HERNIATION". The world-wide experience of "recurrence" is as high as 17%. OUR RECURRENCE RATE HAS BEEN LESS THAN 3 % FOR OVER 25 YEARS. This is partly due to the techniques that we have developed and to our post-operative management. In the Minimally Invasive Microendoscopic Surgery the large back muscles (the fibres of which were spread apart by the special tubular retractor) fall back together to regain their "normal" position. (In the more traditional Microsurgical technique these muscles would be scraped and separated from the bone and then must heal by scarring back down to the bone over the subsequent post-operative months.) The skin incision is then closed in both types of surgery. In our practice, this is accomplished with "hidden" sutures. 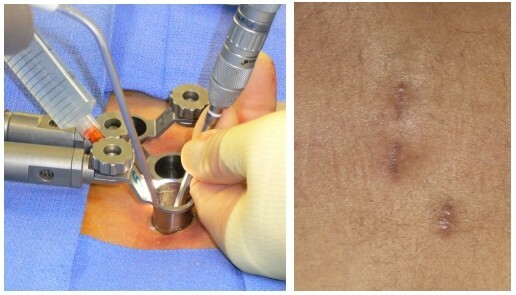 Figure 5: Comparison of Conventional Microsurgery (Left) & Minimally Invasive Technique (Right). The Herniated Disc (Up-curved Arrows) is removed through an opening created in the Lamina. In Minimally Invasive Technique the tube (Horizontal Arrow in Right diagram) separates the large paraspinous muscles as illustrated in this diagram. 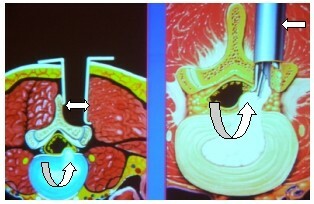 The illustration in Figure 5 depicts the method for surgical access to remove a Herniated Lumbar Disc. Surgical removal of a Herniated Lumbar Disc is done through the back of the patient for both Conventional Microsurgical and Minimally Invasive operations. The Diagram on the left represents a Conventional Microsurgical Retractor while the one on the right is of a Minimally Invasive ("MAST") Tube Retractor. In Minimally Invasive surgery, a small diameter tube is used as the retractor which separates the muscle fibres leaving them attached to the bone of the Spine. The Minimally Invasive technique has the additional major advantage of permitting BILATERAL (both sides of the Spine) operations using a UNILATERAL (one-sided) approach. This highly limits the amount of muscle subjected to any manipulation. Figure 6: An illustration comparing the extent of muscle damage caused by "retractors" used in Lumbar Disc operations. The "BLACK" areas (Vertical Arrows) in the 2 MRI scan "cuts" indicate where muscle has been "damaged" by the retractor systems. It is much less using the Minimally Invasive system. The MRI scan shown in Figure 6 (ABOVE) depicts the 2 types of procedures and illustrates the difference between the two with respect to muscle damage. In each case a "Laminotomy" (opening in the roof of the Spinal Canal) is performed. The Minimally Invasive (or Minimal Access System - also called MAST) results in considerably less damage to the Spinal muscles. This is part of the reason why most patients experience less post-operative pain compared to the more Conventional Microsurgical approach. The Minimally Invasive operation can also be used for Bilateral Procedures (operations on both sides of the spine) using a UNILATERAL (one-sided) APPROACH. It is here where a major difference between the two types of operations becomes apparent to any observer. Under Conventional Microsurgical techniques, the Spinal muscles are stripped widely from the Spinal bones and held under the rigid retractors. When done on both sides of the back, the pain experienced is usually quite significant. A Bilateral operation using a Unilateral Minimally Invasive operation does not disturb the muscles on the opposite side of the Spine at all. Multiple levels (up to 3) can be approached this way. The majority of these patients are able to walk out of the hospital within several hours of operation. 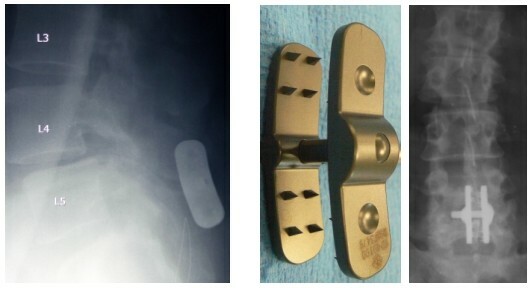 Intra-operative x-rays demonstrating the position of the Medtronic MAST tube retractors. Left (7A): Lumbar spine Antero-posterior (front to back) view. Tube retractor (Curved Arrow) overlies the junction between the Lamina & the Facet. Right (7B): Lateral (side) view. The retractor (Curved Arrow) overlies the L4,5 disc space (Horizontal Arrow) level. Figure 8: Operative Photo of our Neurosurgeons conducting a Minimally Invasive Lumbar Spine operation using a Leica OH-3 Microscope. 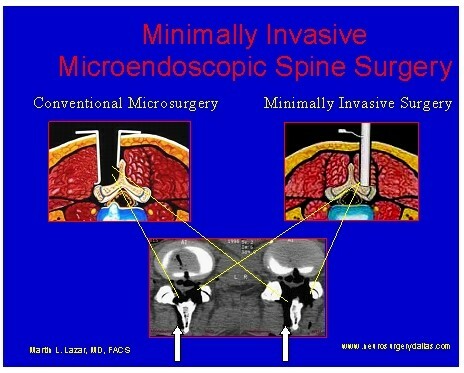 Figure 9: Operative Photo of a Minimally Invasive Lumbar Disc operation. The Neurosurgeon (left) is using a microsurgical electric drill to remove bone while the Assistant Neurosurgeon (right) is "irrigating" the region with a cool saline solution and then removing it with a suction device held in his right hand. 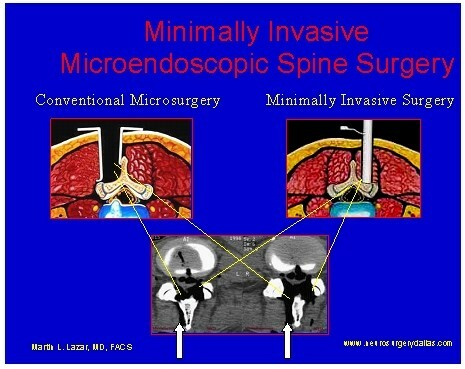 Figure 10: Operative Photo of a Minimally Invasive Lumbar Disc operation. Working through the Medtronic 16 millimeter "MAST" tube retractor and using a microsurgical electric drill to remove bone. The "intense" white light is from the Operating Microscope. The majority of our patients who undergo these procedures are able to walk within 4 hours of operation and are discharged from hospital shortly thereafter. Please consult our Post-operative Lumbar Spine Operation Instructions for our recommendations for after-care. Operations conducted for Herniated Lumbar Disc conditions carry with them a risk to "recurrence" of the problem. That is to say that Disc material that remains within the Disc space AFTER a surgical procedure is at risk to being forced out through the "old" opening in the Disc capsule and Posterior Longitudinal Ligament. While it is not possible to remove all of the Disc material that lies within the Disc space, it is our strong preference to attempt to remove as much Disc material as possible in order to reduce this risk of a "recurrent herniation". The world-wide experience of "recurrence" is as high as 17%. Our "recurrence rate" has been consistently less than 3% for over 25 years. This is partly due to the techniques that we have developed and to our post-operative management. Please review the detailed information on pages 15 & 16 of our comprehensive monograph, Lumbar Disc Herniation & Degenerative Conditions, Part 2, as well as our Post-operative Patient Guidelines for more specific information. Most patients who undergo these operations awaken from surgery essentially free of the severe pain that they had previously endured. Patients generally report that the pain from the incision in the back is not nearly as bothersome as that which they experienced preoperatively. The majority of patients are mobilized out of bed when they are awake and alert. It takes approximately three to four hours to completely recover from the effects of the anesthetic. It is important to get out of bed early unless you have been instructed otherwise. You will be asked to avoid taking excessive narcotic analgesic (pain reliever) in the early postoperative period in order to allow you to be mobilized. Narcotics make people sleepy. This precludes our staff from allowing you to be out of bed. The discomfort from the incision is rarely seriously painful. Actually once you are out of bed and walking, the pain is usually lessened even further. In our experience most patients leave the hospital the same day of surgery. For those patients who undergo a "Laminectomy" procedure, it should be recognized that this more extensive operation (compared to a "Laminotomy" for a Herniated Disc) may result in more discomfort and may require more analgesic medication and a longer stay in the hospital. These will be discussed on an individual basis with the patient involved. Nevertheless, in our experience even in patients undergoing one or two level Bilateral Laminectomies most leave the hospital either the same day or the morning following surgery. For comprehensive additional information please consult our Downloads & Information material as well as our Video Library. For the majority of individuals, this is a normal process of "aging" (when used in relationship to the Disc and the various joints of the Spinal Column). While it is accurate to state that the process begins fairly early, the rate at which it progresses depends on a number of factors, some of which can be influenced by "life style" and habits. Others are less amenable to an individual's control. Genetics or inherited factors (with the exception of certain very rare diseases) probably do not play any significant factor for the average patient. Humans, by virtue of their bipedal (walking on two lower extremities) nature, subject their Spines to forces on a daily, relentless basis that combine to accelerate a natural aging process. It is important to recognize that this affects all of the joints of the Spine as well as the Discs. The lower two Lumbar levels (Fourth and Fifth Lumbar, L4-5; Fifth Lumbar and First Sacral, L-5, S-1) assume a disproportionate weight-bearing burden by virtue of their location in the mechanism and function of the Spine. This "daily trauma" is, to a large extent, unavoidable. Other uncontrollable factors that further accelerate this process include congenital abnormalities of the Spine (defects in the bone and/or muscular parts of the Spine that we are born with) or developmental defects of these structures (those diseases which develop after birth  such as progressive abnormal curvatures called Scoliosis). For each person there are many more factors affecting the "aging" or progressive "degenerative" process, that we can control, which are influenced by daily activities and life styles. Obesity and "over-weight" conditions add an unnecessary weight-bearing requirement. Heavy lifting and repetitive bending (particularly when standing up and leaning over at the waist to lift something) are two factors that are frequent contributors in all societies that require or encourage heavy work. Athletes or individuals who pursue certain sports activities add another dimension of accelerated Disc and Joint deterioration because of the added repetitive trauma to these structures. Whether it is in a weight lifter, jogger, football player, golfer or tennis enthusiast, each pursuit exacts some price with respect to the Spine and Discs. None of this should be misconstrued by the reader as suggesting that these activities are either dangerous or undesirable. GOOD PHYSICAL CONDITIONING HELPS TO ASSURE GENERAL WELLNESS and is very desirable from the point of view of slowing the progressive degenerative processes that the Spine is inevitably subject to. IT IS merely a QUESTION OF DEGREE. We all must recognize that WE PAY A PRICE FOR THE THINGS WE DO. The Spine and its components are among those parts of the body where added "wear and tear" frequently results in an accelerated degenerative condition that ultimately may cause that part to fail to continue to function adequately. The Primary Complaint of most patients is "Low Back Pain" without leg pain. The diagnosis is confirmed with the identification of some characteristic appearances best seen on Neuroimaging studies. A. MRI Scan demonstrates the "dehydration" of the Disc and "decrease" of the Disc space height. The Lumbar Facet Joints demonstrate some degree of Hypertrophy (thickening) as does the underlying Ligamentum Flavum (Yellow Ligament). 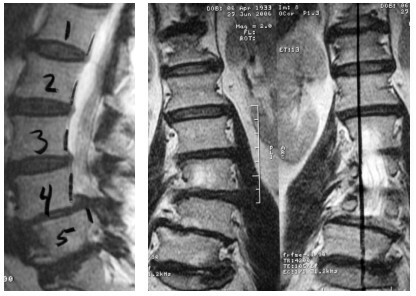 Figure 1A (Left): MRI Scan (Sagittal View) Horizontal Arrows indicate reasonably well maintained Disc Height. The "Light Grey" within the Disc substance indicates the presence of "Fluid" whereas the Disc spaces at L2,3 and L4,5 (Down-curved Arrows) are "collapsed" and "blackened" indicating "dehydration". Figure 1B (Center): MRI Scan (Next Sagittal View Image of this Patient) There is a Large Extruded Disc at L4,5 which has "migrated" inferiorly (Lower Curved Arrow). 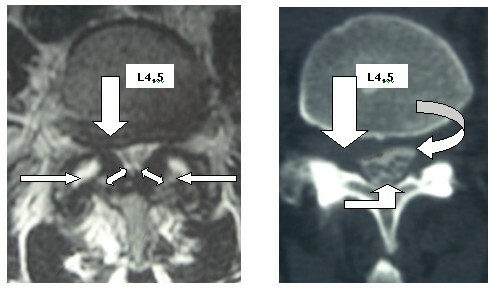 The end of the Spinal Cord is seen at the T12,L1 level (Right Angled Arrow) with the Lumbar Nerve Roots extending below this within the Cerebrospinal Fluid (the "bright white" area within the Spinal Canal). NOTICE the DIFFERENCE in Disc Space HEIGHT between L2,3 and L4,5 compared to the other levels. NOTICE as well that the Discs are "dehydrated" at these 2 levels whereas the other levels are more normally "hydrated and have maintained appropriate Disc space height. Figure 1C (Right): MRI Scan (Axial View-Same Patient) There is a large Extruded Disc at L4,5. The somewhat Hypertrophic (overgrown) Facet Joints are clearly seen (Curved Arrows). 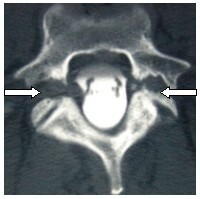 The Hypertrophic Ligamentum Flavum (Vertical Arrows indicating the "Black" structures shaped as an inverted triangle) has combined with the Hypertrophic Facets to cause some mild Spinal Stenosis (narrowing). The L3,4 Disc Space is well maintained and "normal". The L4,5 Disc Space is collapsed, dehydrated with a large extruded Disc that has migrated inferiorly (Down-curved Arrow). 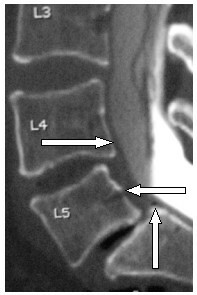 The L5,S1 Disc Space is collapsed and dehydrated with a small "bulge" extending just behind the Vertebral bodies (Up-curved Arrow). The L4 & L5 Vertebral Bodies show a characteristic change called "Modic 1" which is believed to be due to an inflammatory process of "Degenerative Disc Disease". Dr. Michael T. Modic described some MRI appearances that are considered characteristic of "Degenerative Disc Disease" (See Figure 2). These MRI changes are believed to reflect "fibrovascular replacement" of the normal bone marrow of the Vertebral Bodies. However, scientific publications have demonstrated similar appearances in various parts of Vertebral Bodies subjected to trauma and abnormal stress. Professor Modic has stated in an EDITORIAL (published in the Journal of Neurosurgery: Spine Volume 6, pages 150-151, February 2007) that "the altered signal intensity detected by MR imaging is not, in and of itself, the causal process, but rather a reflection of the causal process that I believe is some type of biomechanical stress or instability." "Further unresolved then, in the management of patients is how we can use these observations." "How knowledge of these findings can affect therapeutic management remains untested." "Before we can appreciate the significance of these findings, including their prognostic importance, we need a better understanding of their natural history and relationship to biomechanical factors and symptoms." He cautions that it is "premature given our current state of knowledge" to conclude "that the presence of Type 1 marrow changes in a patient with low-back symptoms is an indication that some type of stabilization or fusion procedure is needed." B. CT Scan does not permit evaluation of the Disc Space other than to assess the intervertebral distance ("Disc Space collapse"). However, it provides better information about the Vertebral Bone and particularly of the Lumbar Facets. DEGENERATIVE DISCS DO NOT, IN AND OF THEMSELVES, REQUIRE TREATMENT. WHILE THERE ARE METHODS TO DEMONSTRATE THAT THE DISC HAS BEEN "DAMAGED", THAT FACT ALONE DOES NOT JUSTIFY, IN OUR OPINION, ANY FORM OF SURGICAL MANIPULATION OR INTERVENTION. There are a number of ways to "Fuse" (permanently immobilize) one or more Disc Spaces. These procedures are reviewed elsewhere on this website. Current advanced techniques include Minimally Invasive procedures. That the Disc itself is subject to progressive degenerative changes, with or without the influence of the "accelerating" factors, is undeniable. Some joints in extremities can be successfully replaced (knees, hips, and finger) although there is a limit as to how long replacement joint materials will last. "Artificial Disc Replacement" is being recommended by some of our more aggressive colleagues, as a primary surgical option for patients with Degenerative Disc "Disease" and/or Herniated Disc. THIS IS A HIGHLY CONTROVERSIAL AREA with proponents using SEVERAL DIFFERENT TYPES OF THESE ENTITIES WHICH ONLY RELATIVELY RECENTLY HAVE BEEN APPROVED BY THE FDA AS MECHANICAL DEVICES SUITABLE FOR HUMAN IMPLANTATION. THE CONCEPTS FOR THE UTILIZATION OF THESE DEVICES ARE STILL BEING EVALUATED. THE UTILIZATION OF SUCH DEVICES IN THE LUMBAR SPINE SHOULD BE RESERVED FOR ONLY THOSE PATIENTS WHO HAVE NO OTHER OPTIONS. THIS IS ONE AREA WHERE A SECOND OR THIRD OPINION WOULD BE STRONGLY ADVISED. Additional Information in our monograph, Lumbar Spine Information Part 2, which is available in our Downloads and Information Library on this website. "Stenosis" means "narrowing". In this context, it is the narrowing of the Spinal Canal. This narrowing is occasionally seen as a "congenital phenomenon". It is more commonly identified consequent to a progression of the "Degenerative Disc Disease" which also affects the related Spine structures. As "Disc Disease" progresses, the Disc becomes dehydrated and progressively collapses to a point where it is no longer an effective "cushion" between the Vertebrae and no longer functions as a "spacer" to keep those bones apart. As a result of this progressive collapse of the Disc Space, the Lumbar Facet Joints begin to over ride one another. As the Facet Joints "over ride", their joint surfaces are subjected to abnormal "wear". The bone and joint's response to this attempt to "wear out" is to FORM MORE BONE, the result of which is a much larger Facet which then encroaches upon the Spinal Canal and the Neural Foramena to produce STENOSIS. Facet Joints (See Figure 1), as part of the Spinal Column's weight bearing mechanism, are particularly subject to vertical pressure as they participate in the "weight bearing" function of the Spinal Column. The Facet Joints are also structures where motion occurs between the adjacent Vertebrae. In time, this motion together with the consequences of "weight bearing" produces excessive "wear and tear". When Spinal Joints are involved in this "wear-and-tear" process, they react in a characteristic method in an attempt to "protect" themselves from wearing out (as ball bearings would in the joints of some machines.) The Facet Joint's surfaces react to produce more bone in an attempt to halt the wearing away. This "new bone" formation results in an overgrowth (Hypertrophy) which eventually encroaches on the Spinal Canal (where the Spinal Nerves reside) making the Spinal Canal (and the Neural Foramen) narrower. One of the paraphenomenon of "Degenerative Arthritis" of the Spine is the progressive "collapse" (or narrowing) of the Disc Space. 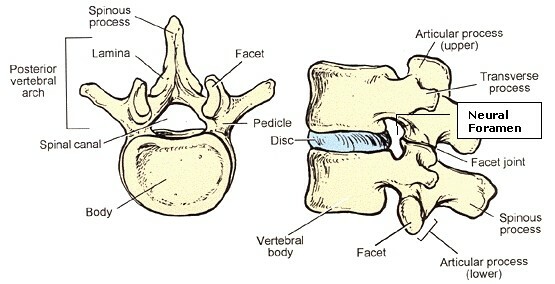 Among the consequences of this Disc Space "collapse" is that the Facet Joint surfaces overlap to a greater than "normal". This, too, adds to the pathological pressures upon the Facet Joints resulting in further Degenerative changes. This bone process is called "Degenerative Arthritis" or "Osteoarthritis". The new bone often has the appearance of "spurs" (also called "Osteophytes.") The process of Degenerative Arthritis is usually a very slow one. It is, to a degree, inevitable in everyone. Some people, for many of the reasons outlined previously, encounter it earlier and to a greater degree than others do. Despite a well-advanced case, some people are not significantly affected either by pain or neurological injury, whereas others can be incapacitated by it. Unfortunately, there are no medications or treatments that can reverse this "degenerative" process. Anti-inflammatory drugs are usually helpful in reducing the pain associated with an acute flare-up of joint inflammation. Occasionally this process of progressive abnormal bone formation results in a very substantial stenosis (narrowing) of the Spinal Canal. This narrowing is consequent to the overgrowth of the Facet Joints as well as the Ligamentum Flavum (Yellow Ligament). This special ligament is part of the normal stabilizing structure of the Spine and lies beneath each Lamina connecting one Lamina to its immediate neighbor above and the one below. The Ligamentum Flavum is subject to stresses just as the Facet Joints are and as a result it participates in this counter-productive degenerative process which ultimately results in a pathological thickening (hypertrophy) of the Ligament. Once the Ligamentum Flavum and Lumbar Facet Joints have become sufficiently overgrown to seriously compromise the diameter of the Spinal Canal and Neural Foramina, substantial pressure is exerted upon the Spinal Nerve Roots. 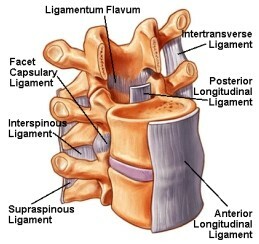 Figure 2: The LIGAMENTS of the LUMBAR SPINE. 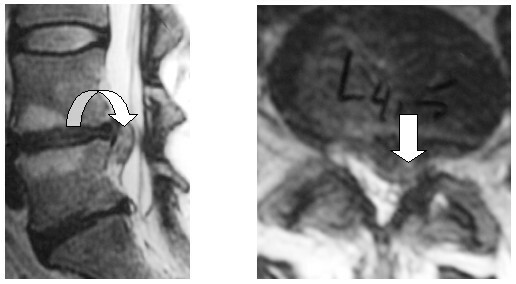 Both views show the "high grade" narrowing of the Spinal Canal at the L4,5 level. The "blockage" to the flow of Myelographic "dye" is indicated by the ABSENCE of the "dye" which is a "water-soluble" substance that mixes with the Cerebrospinal Fluid. The most frequent symptom experienced by patients with Spinal Stenosis is SEVERE PAIN OR CRAMPING IN THE LEGS when trying to walk some distance, a condition called "NEUROGENIC INTERMITTENT CLAUDICATION". It is this Spinal Canal narrowing that squeezes the Nerve Roots within the Spinal Canal that causes this severe pain. In patients suffering from Claudication resulting from Spinal Stenosis there is usually neither isolated muscle weakness nor sensory loss as commonly occurs with Herniated Lumbar Disc situations. However the presence of "tingling", "numbness" and/or weakness DOES NOT PRECLUDE THE DIAGNOSIS of CLAUDICATION consequent to STENOSIS. (Also see the next paragraph) Once the Claudication is severe and the pain becomes a major factor impairing the quality of life, then treatment becomes necessary. 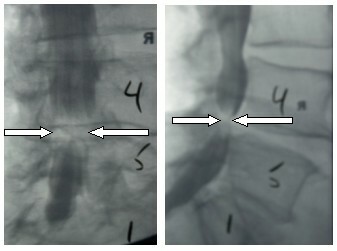 High grade stenosis indicated by the minimal amount of myelographic "dye" (the "white material") within the narrowed Spinal Canal (Vertical Arrow). The "small black dots" within the "white dye" are the Spinal Nerve Roots being tightly squeezed. The Facet Joints (Horizontal Arrows) are overgrown. The Hypertrophic Ligamentum Flavum (the "Dark" space between the "Dye" and the bone of the Lamina indicated by the Bi-directional Arrows) results in compression of the nerves from posteriorly. A "Herniated Disc" can also occur in conjunction with the "Stenosis" described above. In these cases, there is significantly less room within the Spinal Canal and Neural Foramena resulting in substantially greater pressure upon the Nerve Root(s) and a lesser likelihood of recovery without surgical intervention. Once again it is a matter of degree of Neurological Injury and extent of Nerve Root (and/or Spinal Cord) compromise that will help to decide the appropriate form of treatment. When too much pressure is exerted on the Spinal Nerves as they are squeezed against the bone of the Spinal Canal, the pressure can be sufficient to injure the Nerve Root (and/or the Spinal Cord) as well as the small blood vessels supplying these vital structures. The characteristic response by the Nerve Root to this type of injury is for it to "swell". Unfortunately as it swells against the hard bone surface of the Spinal Canal, this produces further pressure on the Nerve Root and its blood supply, which results in more injury to the Nerve Root and progressively more swelling. THIS IS A VISIOUS CYCLE THAT MUST BE INTERUPTED in order to preserve Neurological function. 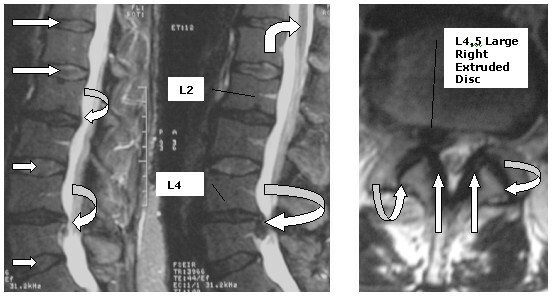 Figure 5A (Left): Lumbar Spine MRI Scan (Sagittal View). 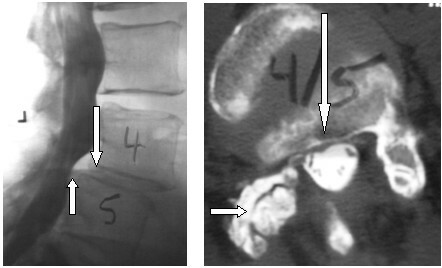 Large Herniated (Extruded) L4,5 Disc with Inferior Migration (Curved Arrow). In addition, the Spinal Canal is narrowed by the Hypertrophic Ligament Flavum (Straight Arrows). 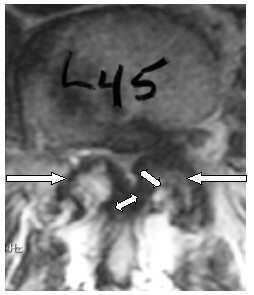 Figure 5B (Right): Lumbar Spine MRI Scan (Axial View just below the L4,5 Disc Space). 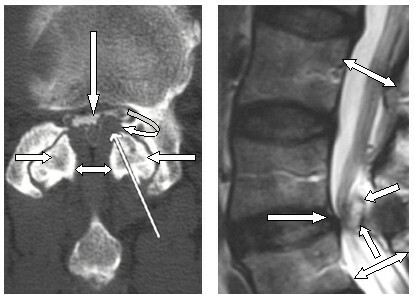 The Herniated Disc is in the Center (Vertical Arrow) of the Stenotic Spinal Canal. The Hypertrophic Facet Joints (Oblique Arrows) and the Ligamentum Flavum (indicated by the Bi-directional Arrows and appearing as "Dark" objects) are compressing the Cerebrospinal Fluid ("White" in the center of the Spinal Canal) and Nerve Roots. The "Synovium" is the "lining" of "joint surfaces". This "joint lining" is subject to "degenerative" changes resulting from the "trauma" that affects the particular Facet Joint. As the Synovium of the Lumbar Facet Joint undergoes "degenerative" change, it also becomes "hypertrophic" (increases in size). These "Degenerative" changes may take several forms. This includes "Cyst" formation as well as pathological "calcification". The "Cyst" may become a significant "mass" within a Spinal Canal that is already compromised by the Spinal Stenosis (initially caused by the Facet and Ligamentum Flavum hypertrophy.) Oftentimes the Cyst becomes quite adherent to the Dura Mater overlying the Nerve Root, making its removal at surgery technically difficult. Figure 6A (Left): Post-myelographic Lumbar CT Scan (Axial View) in a 70 year old Male. 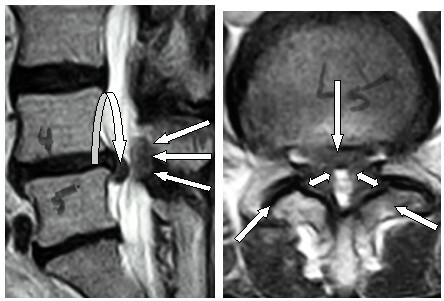 The Hypertrophic Ligamentum Flavum (the dark grey structure within the narrowed Spinal Canal indicated by the Bi-directional Arrow) combined with the Degenerative Hypertrophic Facet Joints (Horizontal Arrows) has resulted in severe Spinal Stenosis as demonstrated by the paucity of myelographic "dye" ("white" substance within the Spinal Canal indicated by the Vertical Arrow). A Synovial Cyst (round object within the Spinal Canal indicated by the Side-curved and Oblique Arrows) on the Left side of the Spinal Canal adds to the considerable pressure on the Nerve Roots. Figure 7A (Left):MRI Scan (Coronal View) 73 year old Female. A "central" Vertical Line drawn from the T11 Vertebra demonstrates the serpentine configuration of this "Scoliotic" Spine. Spondylolisthesis is the term applied to a condition where one Vertebral Body has "slipped" forward relative to the adjacent Vertebral Body. Spondylolisthesis can be a significant causative factor in the Spinal Stenosis mechanism responsible for the symptoms in some patients. This is reviewed in detail in the next major Section following this one. Part of the initial evaluation of a patient with Spinal Stenosis requires a Focused Neurological Examination including the evaluation of the Peripheral Arteries supplying the Lower Extremities. There are some other examinations which can be obtained to evaluate these arteries (such as Ultrasound and Angiography); however, they are much more expensive and unnecessary for every patient. Although plain x-rays of the Lumbar Spine allow for the evaluation of some aspects of the Spine's bone structure, they are of limited value since they cannot identify the presence or absence of a Herniated Disc, Synovial Cyst, Hypertrophic Ligamentum Flavum or the degree of Stenosis. MRI (Magnetic Resonance Imaging) scan is a non-x-ray technique that is often used as the first (or screening) Neuroimaging study in many patients. While it has some limited usefulness in evaluating bone anatomy, it is an excellent technique for evaluating the Spinal Canal, Disc anatomy, the Nerve Roots and the Spinal Cord (which is rarely involved by Lumbar region pathology since the Spinal Cord "ends" near the T12-L1 level). Oftentimes this is the only Neuroimaging method that we will need. It is also an excellent technology for evaluating tumors (almost always benign) within the Spinal Canal. MRI scanning is also very useful in evaluating the Thoraco-lumbar junction of the Spine. The Thoracic area of the Spine lies just above the Lumbar region and is a frequent location for advanced Degenerative Disease and Herniated Thoracic Disc in older people. A CT or CAT (Computerized Axial Tomography) scan is an x-ray examination that is particularly useful for evaluating bone anatomy (including the Facet Joints) of the Spinal Column and (to a lesser extent) the Disc structures. CT Scanning is not part of a routine evaluation of the Spine nor is it often used for "screening" purposes. CT Scanning is vitally important when combined with Myelography. "MYELOGRAPHY" (See Figure 3) coupled with "POST-MYLEOGRAPHIC CT SCANNING" (See Figures 4, 6A, 11A & 11B) is regarded as the "gold standard" Neuroimaging method for evaluating Spine problems. This procedure involves placing a long needle in the patient's lower Lumbar region, through the Dura Mater and into the "Subarachnoid Space" in order to gain access to the Cerebrospinal Fluid (CSF). A water-soluble "Dye" substance is injected through the needle into the CSF which then circulates around the Nerve roots and is "visible" on x-ray. However, this is an "invasive procedure" that we reserve for patients where the MRI Scan has failed to provide adequate information and only when these patients are operative candidates. It is not to be considered as part of a routine evaluation for Spine patients nor is it required for all patients who are to undergo Spinal operative intervention. The specific indications for this procedure are reviewed in our Monograph PART 2 of this Patient Information Series. Other investigation methods such as bone scanning, bone density testing and PET (Positron Emission Tomography) are generally not required for patients with new onset of symptoms unless that routine testing (such as reviewed in the preceding paragraphs of this document) fails to establish the diagnosis or some additional problem is identified that requires further elucidation (such as a tumor involving the Vertebral Bone). STENOSIS CANNOT BE TREATED BY MEDICAL OR NON-SURGICAL METHODS. Steroids cannot affect the Bone, Facet Joint, Disc or Ligament conditions that are part of this complex condition. Steroids can reduce the swelling of the Nerve Roots that may have occurred as a result of some acute change. Nevertheless, placing a catheter into an already compromised Spinal Canal in the presence of swollen and damaged Nerve Roots is actually placing those Nerve Roots at more risk. A better alternative to manage the ACUTE NERVE ROOT SWELLING, in our opinion, is to use ORAL STEROIDS which, in adequate dosage, will be just as effective and far less dangerous with considerably less cost. WE STRONGLY CAUTION AGAINST THE USE OF EPIDURAL STEROID INJECTIONS (ESI) IN THE FACE OF HIGH GRADE STENOSIS, PARTICULALRY IN THE PRESENCE OF WEAKNESS OF THE EXTREMITIES. All surgical therapies designed to relieve the compression of the Neural elements (Nerve Roots and/or Spinal Cord) caused by LUMBAR SPINAL STENOSIS usually require the removal of those portions of the Spine that are causing the problem. The most frequent operations performed for these diseases involve an avenue of approach from the back (posterior). All of these techniques involve the removal of part or all the "roof" of the Spinal Canal in the affected area. The "roof" of the Spinal Canal is formed by the Lamina of the Vertebra. Removal of the Lamina ON BOTH SIDES is called a "LAMINECTOMY". Removal of the Lamina ON ONLY ONE SIDE is called a "HEMILAMINECTOMY." There are some "limited" operations that are mainly used for focal and restricted narrowing (with or without a Herniated Disc.) 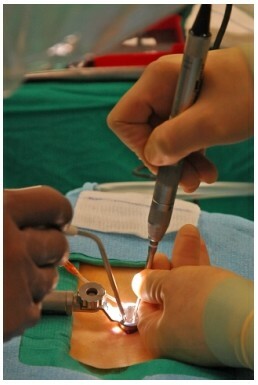 The most common of these procedures involves removing only a thumbnail-size piece of bone from the Lamina in order to gain access to the Spinal Canal where a Herniated Disc fragment is compressing the Nerve Root, in patients with an isolated Synovial Cyst or in those with a limited area of Ligamentum Flavum Hypertrophy. This procedure is called a "LAMINOTOMY" (or opening in the Lamina). The bony canal through which the Nerve Root travels as it leaves the Spinal Canal is called the "Neural Foramen". It is almost always desirable, and frequently fundamentally necessary, to remove part of the roof of this Foramen in order to decompress (relieve pressure on) the Nerve Root. This procedure is called a "Foraminotomy." Any of these procedures can be used in combination to suit the unique technical requirements for any particular patient circumstance. In the event that a Bone Spur is the culprit causing the Nerve Root compression, it may be possible to remove it. This is usually the case if the Bone Spur originates from the Facet Joint directly behind the Nerve Root. However, if the Bone Spur projects from the front of the Spinal Canal, it may not be possible to safely remove all or any of the Spur. The "decompression" of the Spinal Canal and the affected Neural Foramen is most frequently very successful in treating the symptoms and signs of this problem. While it is quite evident that when all or part of the Bone Spur remains in place, it could continue to enlarge, it is actually UNLIKELY TO CAUSE any further major difficulties provided an ADEQUATE DECOMPRESSION HAS BEEN ACCOMPLISHED. In both cases, the Lamina (which forms the "roof" of the Spinal Canal) must be removed in order to gain access into the Spinal Canal and perform the required "decompression" of the Nerve Roots which are protected within a leather-like covering (the Dura Mater). Figure 9: An illustration comparing the extent of muscle damage caused by "retractors" used in Spine operations. 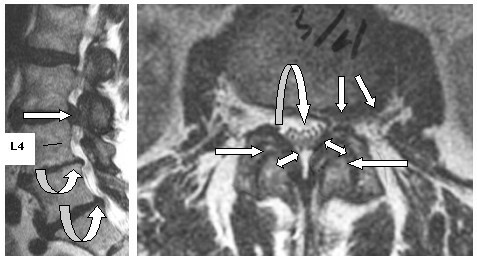 The "BLACK" areas (Vertical Arrows) in the 2 MRI scan "cuts" indicate where muscle has been "damaged" by the "Conventional Microsurgery" retractor systems, whereas, it is much less using the Minimally Invasive system. The MRI scan shown in Figure 9 (ABOVE) depicts the 2 types of procedures and illustrates the difference between the two with respect to muscle damage. In our experience, MANY OF THESE PATIENTS ARE ABLE TO WALK OUT OF HOSPITAL WITHIN SEVERAL HOURS OF SURGERY. It is now possible, in many patients, using Minimally Invasive Microendoscopic Surgery to actually perform the Laminectomy procedure on BOTH sides (bilateral) of the Spine using a ONE-SIDED (unilateral) APPROACH. This is a significant advance since the post-operative pain is usually much less than in our more traditional approach because we are not stripping muscle from bone. Although this technique is not always possible in all cases, MOST SPINAL STENOSIS PATIENTS CAN BE MANAGED THIS WAY BY A NEUROSURGEON EXPERIENCED IN THIS ADVANCED TECHNIQUE. The underlying anatomical pathological causes of Spinal Stenosis (Hypertrophic Ligamentum Flavum and Hypertrophic Lumbar Facets) can both be successfully relieved using Minimally Invasive procedures. 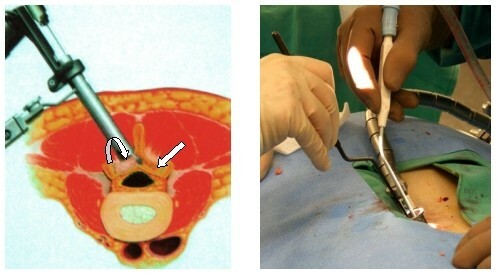 Figure 10A (Left): Anatomical Diagram to Demonstrate the Technique to Perform a Minimally Invasive Microendoscopic BILATERAL LAMINECTOMY using a UNILATERAL APPROACH. The Paravertebral Muscles remain intact as the special Minimally Invasive "Tube Retractor" separates and preserves the muscles fibres. In this illustration, the Lamina on the side of the tube Retractor has been removed (Curved Arrow). The retractor was then angled towards the opposite side allowing the Neurosurgeon to drill and remove the Lamina (Oblique Arrow) on the OPPOSITE SIDE. The OPPOSITE LAMINA is removed from the INSIDE of the Spinal Canal. The drilling is accomplished within the Epidural Space which requires considerable technical skill. The muscles on the "Opposite" side are never disturbed. Figure 10B (Right): Our Neurosurgeons performing this procedure through a 16 millimeter diameter tube retractor. The tube has been angled towards the opposite side in a manner similar to the illustration in Figure 10A. Degenerative Osteoarthritis resulting in Spinal Stenosis commonly occurs at MULTIPLE LUMBAR LEVELS in many of these patients. Oftentimes a multi-level Decompressive Laminectomy is required in order to adequately relieve the severe stenosis. Over the past years, we have demonstrated the feasibility to routinely manage Multi-level Lumbar Spinal Stenosis using MINIMALLY INVASIVE UNILATERAL Techniques by incorporating multiple "ports" simultaneously. Figure 11A (Left): Post-myelographic CT Scan (Axial View) in a 71 year old Female with Rotoscoliosis and Multi-level Degenerative Osteoarthritis. This L2,3 level study demonstrates the Facet and Ligamentum Flavum Hypertrophy resulting in compression of the Nerve Roots within the Stenotic Spinal Canal. The Nerve Roots are the "small black dots" within the Cerebrospinal Fluid (indicated by the "white" area within the Spinal Canal). In this case the Nerve roots are being compressed on either side of the Stenotic Spinal Canal at the points indicated BETWEEN the Curved Arrows. Figure 11C (Right): CT Scan (Coronal View-Same Patient). The vertical line drawn through the midline of the L2 Vertebral Body demonstrates the extent of the Rotoscoliosis. There are severe degenerative changes within the L4,5 & L5S1 Disc Spaces as well; however, these have not caused any Neurological problem for the patient. 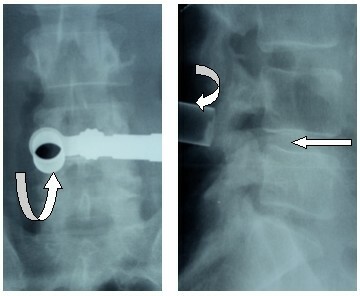 Figure 13: Intra-operative X-ray (Same Patient as Figures 11 & 12) for localization of the Minimally Invasive Tube Retractors. THIS 71 YEAR OLD FEMALE UNDERWENT A BILATERAL INFERIOR � OF L2, COMPLETE L3 & SUPERIOR � OF L4 DECOMPRESSIVE LAMINECTOMY WITH MULTI-LEVEL BILATERAL FORAMENOTOMIES. THE MARKEDLY HYPERTROPHIC LIGAMENTUM FLAVUM WAS EXCISED RESULTING IN EXCELLENT DECOMPRESSION OF HER SPINAL CANAL. SHE WAS OUT OF BED AT 4 HOURS POST-OPERATIVE AND DISCHARGED HOME THE MORNING FOLLOWING THE OPERATION. HER PRE-OPERARTIVE CLAUDICATION SYMPTOMS AND NEUROLOGICAL DEFICIT (FOCAL WEAKNESS) WERE RELIEVED IMMEDIATELY. Figure 14 A (Left): Intra-operative X-ray with placement of 3 Minimally Invasive Tube Retractors. Because of the type and extent of disease in this 56 year old Male Patient, 2 retractors are on the patient's LEFT SIDE (L3,4 & L4,5) and 1 retractor is at L5,S1 on the Right. 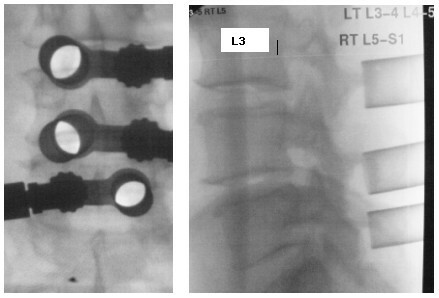 Figure 14 B (Right): Intra-operative X-ray (same Patient) for localization of the 3 retractors at L3,4; L4,5 & L5S1. Figure 15 A (Left): Operative Photo (Same Patient as Figures 13 & 14) Our Neurosurgeons performing MINIMALLY INVASIVE MULTI-LEVEL BILATERAL DECOMPRESSIVE LAMINECTOMIES through 3 separate "ports" in order to RESTORE NEUROLOGICAL FUNCTION, LIMIT THE EXTENT OF PARASPINAL MUSCLE TRAUMA, REDUCE POST-OPERATIVE PAIN, REDUCE HOSPITAL LENGTH OF STAY, REDUCE OVERALL COST AND PERMIT AN EARLIER RETURN TO WORK. Figure 15B (Right): Photo of Multi-port incisions (Same Patient as Figures 13, 14 & 15A) at 3 weeks post-operative. THIS PATIENT WALKED AT 4 HOURS POST-OPERATIVE AND RETURNED HOME THE MORNING FOLLOWING OPERATION. HIS NEUROLO0GICAL DEFICITS & SYMPTOMS HAVE RESOLVED. Most patients who undergo these operations report that the pain from the incision in the back is not nearly as bothersome as the pain which they experienced preoperatively. In most cases they are essentially immediately free of the severe leg pain that they had previously endured. The majority of patients are mobilized out of bed within four (4) hours post-operative when they are awake and alert and have recovered from the effects of the anesthetic. This early mobilization is important in helping to diminish post-operative muscle spasm. Patients are asked to avoid taking excessive narcotic analgesic (pain reliever) in the early postoperative period in order to allow them to be mobilized. Narcotics make people sleepy. This precludes our staff from allowing patients to be out of bed. The discomfort from the incision is rarely seriously painful. Actually once the patient is out of bed and walking, the pain is usually lessened even further. In our experience most patients undergoing these Minimally Invasive Decompressive Procedures for Spinal Stenosis are able to leave the hospital either the same day or the morning following surgery. The "Interspinous Process Decompression System" is a relatively new Minimally Invasive procedure that is used to relieve the Neurogenic Intermittent Claudication symptoms of Lumbar Spinal Stenosis. X STOP� is one such device that has achieved FDA approval at the time of this writing. There are other systems (such as the "DIAM" device, the "Coflex", the "Wallis" and the "Spire") that are becoming available as well. All of these implants are either made from titanium or other long-lasting materials and perform in a similar way. They are inserted between the "Spinous Processes" (the thin projections from the back of the Spinal bones to which muscle and ligaments are attached) of the lower Lumbar Spine. The therapeutic concept underlying these devices is based upon the clinical observation that Spinal Stenosis patients tend to walk with a "bent forward" posture since they have learned that this is more comfortable. In fact, this posture actually results in a small (although frequently sufficient) degree of "opening" or "enlarging" the Stenotic Spinal Canal. These implants PREVENT THE PATIENT FROM "EXTENSION" AT THE AFFECTED SEGMENT and "force" a slight "forward tilt" (anterior-directed flexion) or NEUTRAL POSITION to the Vertebrae resulting in a similar, more "permanent", opening of the Spinal Canal. The goal for this therapy is to relieve some or all of the "Claudication" symptoms of Lumbar Spinal Stenosis and improve a patient's ability to function. These implants are indicated for treatment of patients aged 50 or older suffering from Neurogenic Intermittent Claudication (pain or cramping in the legs) secondary to a confirmed diagnosis of Lumbar Spinal Stenosis and for those patients with moderately impaired physical function who experience relief in flexion from their symptoms of leg/buttock/groin pain, with or without back pain, and have undergone a regimen of at least 6 months of non-operative treatment. The device may be implanted at one or two Lumbar levels. Figure 16A: (Left) Intraoperative Lumbar Spine x-ray in one of our patients after Minimally Invasive implantation of the "Interspinous Decompression" device at the L4,5 level. 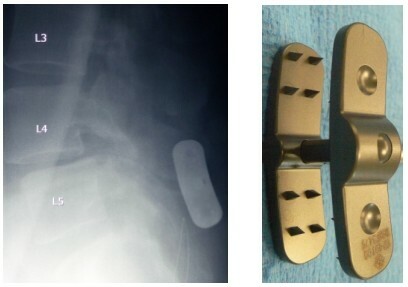 Figure 16B: (Right) Operative Photograph of Medtronic Sofamor-Danek's Interspinous (SPIRE) device prior to implantation in the patient demonstrated in Figure 10A. All of these implants are designed to be placed between the Spinous Processes of the symptomatic Lumbar levels in order to limit extension of the Spine in the affected area. This altered position may relieve the symptoms of Lumbar Spinal Stenosis in some patients. This new technology also has the potential for use as "fixation" or "stabilizing" procedure when combined with other Minimally Invasive techniques such as in older patients with a mild form (Grade 1) of Spondylolisthesis and Spinal Stenosis. In this case a Minimally Invasive Decompressive Laminectomy may be combined with the insertion of the Interspinous Decompression System in order to assist in maintaining "stability" of the Spine. active systemic infection or infection localized to the site of implantation. Lumbar Disc Herniation & Degenerative Conditions, Part 2 is a comprehensive review of these problems and treatments. DISCLAIMER: Every effort has been made by the author(s) to provide accurate and up-to-date information. However, the medical knowledge base is dynamic and errors can occur. By using the information contained herein, the viewer willingly assumes all risks in connection with such use. Neither the author nor Neurosurgical Consultants, p.a. shall be held responsible for errors, omissions in information herein nor liable for any special, consequential, or exemplary damages resulting, in whole or in part, from any viewer(s)' use of or reliance upon, this material. Spondylolisthesis is a condition where one Vertebral Body has "slipped" forward (or backwards) upon the adjacent Vertebral Body resulting in a "misalignment" of the Spine. This clinical problem may be the result of a progressive degenerative change in the Facet Joints of the Vertebrae, a traumatic disruption of these Facet Joints or of a congenital structural defect involving the portion of the Vertebra that "connects" the Facet Joint to the Vertebral Body (known as the "Pars Interarticularis"). In the event of a congenital defect, this problem may have never previously been apparent and may only be detected in later years. This term, "Spondylolisthesis", is almost exclusively reserved for alignment problems of the Lumbar Spine and results from a failure of "normal" bone structures to maintain the anatomical alignment of the Spine. This means that one Vertebra (or occasionally two Vertebrae) "slips" forward (or backwards) relative to each other. The degree of slippage is referred to as either Stage 1 (minor slip of less than a 1/3 of the Vertebral Body distance); Stage 2 (slippage of a distance 1/3 to 2/3 of a Vertebral Body) or Stage 3 (slippage of greater than 2/3 of the Vertebral Body distance.) There are some additional "slippage" problems which include dislocation of the Vertebral Body to one side (or "laterally" - a "Lateral Listhesis") which makes surgical correction even more complicated. 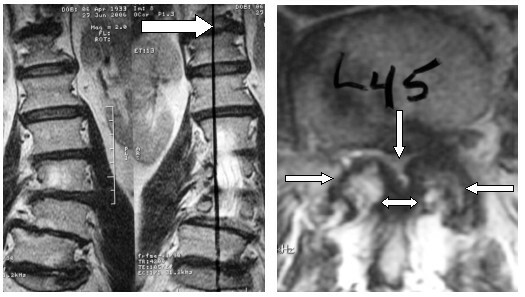 Grade 1 "Retrolisthesis" of L4 (Upper Horizontal Arrow), which has slipped backwards (Posterior) relative to the L5 Vertebral Body. Grade 2 Spondylolisthesis at the L5, S1 level. The L5 Vertebral Body (Lower Horizontal Arrow) has slipped forward on S1. Note the "back" (Posterior) part of the S1 Vertebra (Vertical Arrow) lies well behind the Posterior corresponding portion of the L5 Vertebral Body just as the Posterior part of the L4 Vertebra lies behind the Posterior corresponding portion of the L5 Vertebral Body. The cause of Congenital Spondylolisthesis is a bone defect in the Pars Interarticularis (the bone connection between the Facet Joints and the Vertebral Body). 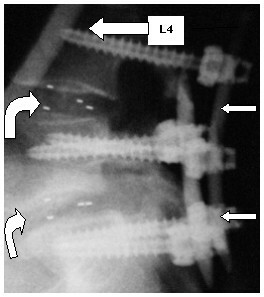 The Pars Interarticularis defect is identified by the bone "gap" (Arrows) in Figure 2. See Figure 3 for the Post-operative X-ray of this Lady. In patients with a congenital form of Spondylolisthesis the condition becomes apparent in the late teenage years to the 30's. The "congenital" problem responsible for this is a defect (failure to form) a small bridging Vertebral Bone element called the "Pars Interarticularis" (see Figure 2). This means that one or both Facet Joints of one of the Vertebra have failed to connect to the remainder of its Vertebra resulting in instability. "Traumatic" Spondylolisthesis is the least common form of this entity. Fractures of one or both Facet Joints of a Lumbar Vertebra may result in this slippage. These anatomical "misalignments" frequently result in compression of the Neural Elements (Nerve Roots either within the Spinal Canal and/or as they exit the Spinal Canal through the Neural Foramina.) This may cause injury to those Nerve Roots resulting in neurological problems such as weakness and/or sensory impairment in the Lower Extremities which is usually mild in the beginning. In unusually advanced cases, patients may suffer impairment of bowel and/or bladder function in addition to weakness of the muscles of the legs and loss of sensory function in the Lower Extremities and Perineum. Pain and/or neurological deficit(s) frequently bring this condition to the patient's awareness. The degree of pain varies from one person to the next. Some, with advanced degrees of slippage (Stage 2) may not have had pain in previous years despite the fact that there was instability for many years when their condition was only a Stage 1 variety. Others have minor degrees of slippage and suffer considerable pain. Spondylolisthesis may be accelerated by or a potential associated "cause" of significant additional structural abnormalities of the Spine. 1. Scoliosis and Rotoscoliosis: Scoliosis (an abnormality described as a "twisted spine" often also has a "rotary" component called "Rotoscoliosis") creates an abnormal "weight bearing" structure resulting in accelerated degenerative changes in the Facet Joints. As demonstrated in Figures 6 & 7, these degenerative and destructive forces cause these Facet Joints to "fail" resulting in "Spondylolisthesis". 3. Spinal Stenosis: The progressive degenerative changes that affect the Facet Joints are often accompanied by pathological Hypertrophy of the Ligamentum Flavum. This, in combination with the Hypertrophy of the Facet Joints and the "slippage" of one Vertebra on the next, may result in severe Spinal Stenosis. A case illustration of Stenosis with Spondylolisthesis and a Herniated Disc is presented in Figures 8 & 9. There are NO MEDICATIONS that can affect the INSTABILITY associated with Spondylolisthesis. Anti-inflammatory medications (usually in the form of Non-steroidal medications - also called "NSAIDs") may help in the management of painful flare-ups that are not related to Nerve Root compression. Once Neurogenic Intermittent Cauda Equina Claudication and/or Neurological Deficits related to Nerve Root compression injury occurs, surgical intervention becomes an important consideration. THE FUNDAMENTAL CONCEPT OF THE SURGICAL TREATMENT FOR THE INSTABILITY ASSOCIATED WITH SPONDYLOLISTHESIS INVOLVES ESTABLISHING AND MAINTAINING STRUCTURAL STABILITY OF THE SPINE WHILE RELIEVING PRESSURE ON THE AFFECTED NERVE ROOTS. In most of these SYMPTOMATIC cases, the indication for surgical intervention becomes quite clear. Since Spondylolisthesis is a condition of INSTABILITY OF THE SPINE, surgical treatment almost always means that some form of "fusion" (stabilization) operation is required. Although we are often able to re-establish the precise anatomical integrity of Spinal Vertebral alignment, for many patients with this condition, the surgeon can reduce the degree of slippage without restoring "perfect" alignment and still obtain a very satisfactory long term clinical result. The degree of the patient's original slippage together with certain anatomical features peculiar to that patient may reduce the probability to achieve a complete anatomical reduction of the slippage; however, rarely does this compromise the end result provided that stability and adequate Nerve Root "decompression" has been achieved. The surgical process involved in Spondylolisthesis generally requires several distinct steps which are almost always carried out simultaneously. The "fusion" portion usually requires placing a device between the Vertebral Bodies that were previously in misalignment. The goal will be for bone to grow from one Vertebral Body to the adjacent one in order to maintain LONG-TERM STABILITY. Additional STRUCTURAL STABILITY and ALIGNMENT is established with the incorporation of some other form of "fixation" device(s) such as pedicle screws and rods, interspinous fixation device and/or posterior (or postero-lateral) bone fusion. All of this is meant to demonstrate that there are several modern stabilization/fusion methods available. The surgical recommendations are usually discussed on an individual basis with each patient and depend on the particular clinical presentation (including neurological status), age, bone density, degree of slippage, associated structural and medical issues and weight. Of particular interest now is the introduction of Minimally Invasive Spinal Fusion techniques. These have some significant advantages as a result of the operations being accomplished with less destruction of the important Spine Muscles by using relatively small incisions. 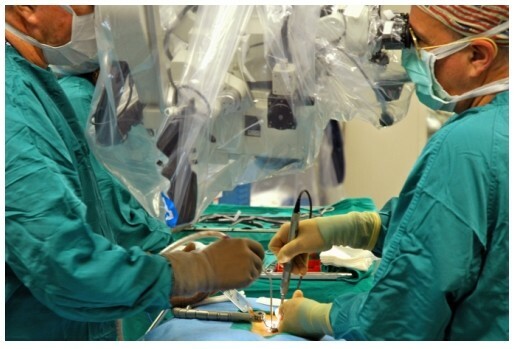 Patients undergoing Minimally Invasive Lumbar Spine Fusion generally experience LESS POST-OPERATIVE PAIN, which means earlier ambulation, shortened hospital stay, less risk to hospital associated complications (including infection), earlier return to work activities and less cost both to the patient and to society in general. In our experience, most patients are mobilized earlier, are usually walking around the hospital ward within 4 hours of surgery and are discharged from hospital the morning following surgery. There is one form of Minimally Invasive "stabilization" procedure (called "Interspinous Fixation") that is actually accomplished on an out-patient surgery basis with discharge from the hospital within several hours post-operative (see Figures 4, 5 and 12 below). Trans-foramenal (2-level) Lumbar Interbody Fusion (TLIF) with Pedicle Screws and Rods (Small Horizontal Arrows) has achieved almost perfect anatomical reduction of the Complex Spondylolisthesis in this lady. Note: Compare the pre-operative Lateral View to this post-operative image to appreciate the excellent reduction of the pre-operative subluxation (dislocation) at both levels. The Interbody Graft material is "translucent" on x-ray. Its position is indicated by small metallic "markers" imbedded in the "graft" (Right-Angled Arrows). Figure 4B (Center): MRI Scan (Sagittal View-Same Patient). Spondylolisthesis L4 on L5. Collapsed L4,5 Disc Space with Stenosis and Herniated Disc (Arrow). Figure 4C (Right): Post-myelographic CT scan (Sagittal View-Same Patient). Spondylolisthesis at L4,5 is better appreciated. The Stenosis is indicated by the absence of myelographic dye at the L4,5 level (Curved Arrow). 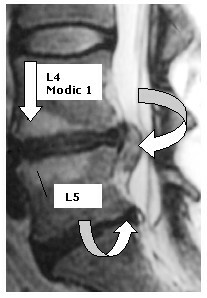 Compare the Spinal Canal diameter at L4,5 to the other levels. Figure 6A (Left): Pre-operative Lumbar Myelogram (Lateral View). Grade 2 Spondylolisthesis of L4 on L5 (Vertical Arrows indicate the Posterior aspect of each Vertebra) in a 57 year old Female with a long history of severe low back and Right>Left Leg Pain. 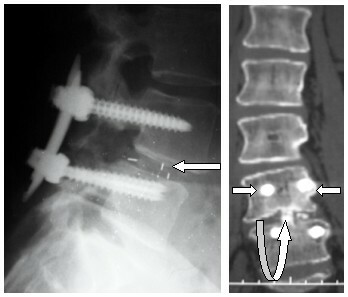 Figure 7A (Left): Post-operative Lateral Lumbar Spine X-ray (Same Patient as Figure 6) A nearly perfect anatomical reduction after a Minimally Invasive Transforaminal Lumbar Interbody Fusion (the Horizontal Arrow indicates the "Markers" embedded in the Fusion device) and Pedicle Screw & Rod Fixation. Figure 7B (Right): Post-operative Lumbar CT Scan (Coronal View in the Same Patient). The position of the Pedicle Screws is apparent. The "Interbody Bone Fusion" (Curved Arrow) is seen in the Midline. The long-standing "Rotoscoliosis" is more apparent on this study. 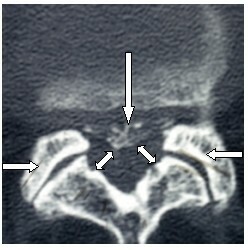 Figure 8A (Left): The Black Arrow indicates the Far Lateral Herniated Disc. The Right Facet is markedly Hypertrophic and encroaches on the Spinal Canal (Vertical Arrow). 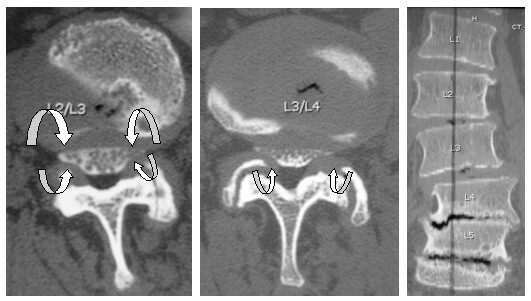 Figure 8B (Center): The next "lower CT slice" shows the Far Lateral HNP (the dark grey area indicated by the Vertical & Horizontal White Arrows and the Black Arrow) as well as the stenosis secondary to the Facet & Ligamentum Flavum Hypertrophy and the Spondylolisthesis. Figure 9A (Left): Pre-operative Post-myelographic CT Scan (Sagittal View in the same patient as Figure 8). Grade 1 Spondylolisthesis of L4 on L5. The Arrows indicate the Posterior (back) aspects of the L4 and L5 Vertebral Bodies. L4 sits anterior to L5. Figure 10A (Left): MRI Scan (Sagittal View) in a 73 year old Female with Grade 2 Spondylolisthesis of L4 on L5. Figure 10B (Right): MRI Scan (Coronal Views-Same Patient) with severe Scoliosis. The Far Right Image has a straight line drawn through the Midline of the uppermost Vertebral Body to demonstrate the extent of this Spinal Curvature. NOTE: DESPITE THE SEVERE STENOSIS, SIGNIFICANT (Grade 2) SPONDYLOLISTHESIS AND ROTOSCOLIOSIS IN A 73 YEAR OLD, A MINIMALLY INVASIVE BILATERAL DECOMPRESSIVE LAMINECTOMY (UNILATERAL APPROACH) TOGETHER WITH SOME FORM OF MINIMALLY INVASIVE FIXATION AND STABILIZATION CAN BE SUCCESSFULLY ACCOMPLISHED. 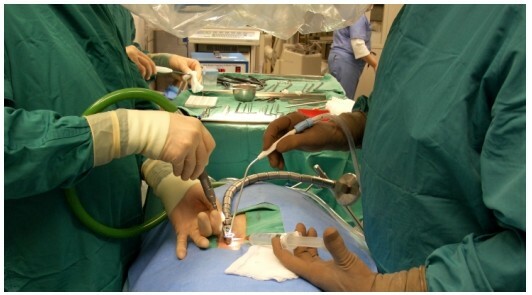 "Interspinous Fixation" is one form of Minimally Invasive "fixation" system that is actually accomplished on an out-patient surgery basis with discharge from the hospital within several hours post-operative (see Figures 4 & 5 above and 12 below). This procedure can be combined with Minimally Invasive Decompressive Laminectomy and some form of "Bone Fusion". OLDER PATIENTS WITH GRADE 1 SPONDYLOLYSTHESIS (WITH OR WITHOUT THE REMOVAL OF A HERNIATED INTERVERTEBRAL DISC) AND A "COLLAPSED" INTERSPACE MAY NOT REQUIRE A BONE FUSION AS PART OF THE DEFINITIVE OPERATION SINCE THEY MAY WELL NOT SLIP ANY FURTHER. IF THE DISC SPACE IS NOT COLLAPSED THEN SOME FORM OF BONE FUSION IS PROBABLY REQUIRED. 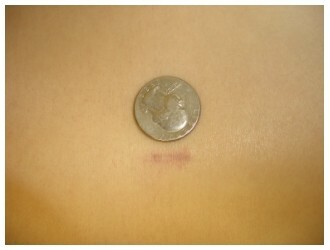 Figure 12B (Center): Photograph of Medtronic's Interspinous (SPIRE) device. 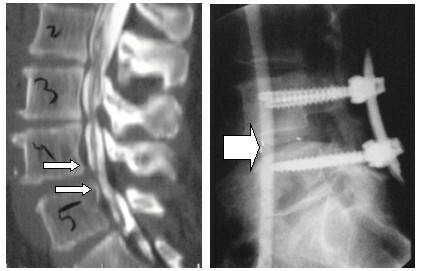 Figure 12C (Right): Antero-posterior X-ray (Same Patient) demonstrating the position of the "Interspinous Device". The "Rotoscoliosis" is also apparent. NOTE: This patient's pre-operative Neurological deficit resolved rapidly as did her Nerve Root pain and Neurogenic Intermittent Claudication. She was managed on a "Day Surgery" basis and went home within a few hours of the operation.